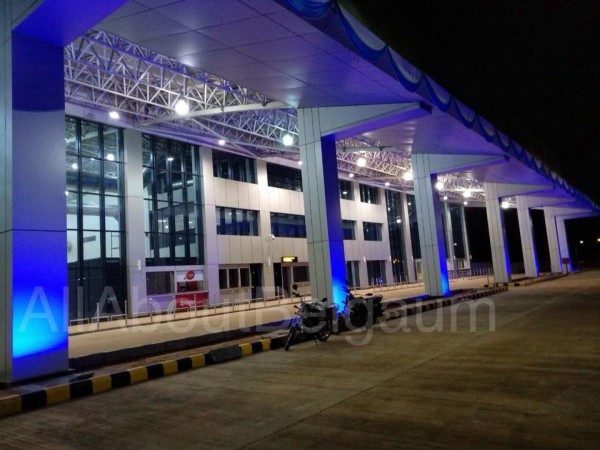 The new terminal building of the upgraded Belagavi airport which was planned to be commissioned from Today has been delayed and will not be used for the next fortnight atleast. The new terminal building which was inaugurated recently seems to have some more work to be done after which the said terminal building will be commissioned. From today the Belagavi Chennai direct flight and additional evening Bengaluru flight will commence. It has now connected Chennai directly from Belagavi earlier it was hop over flight but now its a direct 1 hour 40 mins flight to Chennai. Departs IXG 7.15 PM arrives Chennai at 8.55 PM. Also Spicejet has added a morning flight to Bengaluru which departs IXG 9:25 AM and reaches Chennai at 10:45 AM. Belagavi is now also connected to Surat, Kolkatta, Hyderabad, Delhi, Ahemdabad by Connecting flights. Good news that the flight started. Convenient for passengers instead of 1.5 day train journey. On 3rd Oct , I availed blore flight 9:25am, but due to poor visibility the flight did not land and went directly to Bangalore. However rescheduled flight left blgm around 1:40pm only to land in blore around 3:15 pm due to maintenance work at blore airport. Not a good experience I had that day. Savior was veg pullov, tea, biscuits, juice and dharward pedha provided on inauguration of first flight and delay compensation from spicejet:). Without political will nothing will change. Comment:Will you mention which type of Aircraft whether Airbus 320 or 321 for the newly inagurared flight. Show case the fare also!!! !